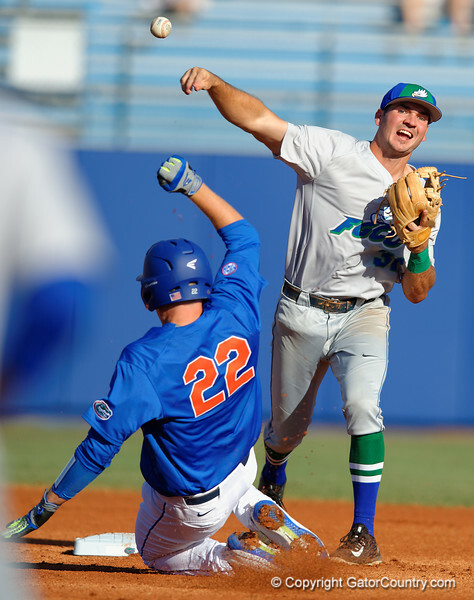 The Florida Gators baseball team hosted Florida Gulf Coast University and came from behind to win the second game of the series 8-4 and start the season 2-0. Florida Gulf Coast University second abseman Ryan Shinn throws to first for the double play as Florida Gators catcher JJ Schwarz slides into second during a Gators win against Florida Gulf Coast University to start the season 2-0. February 20th, 2015. Gator Country photo by David Bowie.